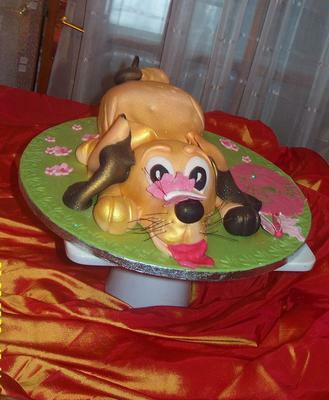 To make this Golden Retriever puppy cake, bake an 11 inch square cake. Knead a 2 kg sugar paste light orange in color. Also knead 500 grams sugar paste in a green color to be used for the cake board. You will also need 200 grams of black for the tail, ears and eyes. Finally, you will need a golden spray. First cut the square cake into triangles. You will need one for the head and one for the body. Next, shape the triangle you cut for the body into a sitting dog shape. Cover with buttercream and the orange paste. Next, mold the triangle you cut for the head into the head shape and cover it with buttercream and orange paste as well. Next, spray the entire body and head with the golden spray. Mold the four legs and place them in their positions as shown in the pictures above. Mold the ears and place them into position as well as the eyes and nose. This is very pretty. I love this cake.